All session pricing includes the session fee and a specified number of digital images in high resolution, sized 16x24 and delivered via online gallery. A deposit of $250 is due at the time of booking to secure your chosen date. The balance is due by the day of your session. Upon delivery of your online gallery, you will have access to an online store to purchase printed products such as prints, canvases, and albums, or you can print them at the lab of your choice. All products in the store are high quality and printed by some of the best labs in the United States. More sizes, custom collections and additional items are available by request. What It's Like: Welcoming a new baby home is such an important part of your family’s story. The beautiful way that tiny little human fits so perfectly in to your family is what we focus on during your session. We capture plenty of images of baby alone – all the little perfect details of them - as well as photos of you cuddling, soothing, and simply adoring your new baby. Siblings and pets are encouraged to be a part of the shoot as well. We take things easy, work with your baby’s needs, take breaks for feeding, changing, and soothing – and end up with the most beautiful gallery of images, all captured in the comfort of your home. During our time together, I’ll guide you in to poses that feel natural so images will look organic and real - not stiff or overly posed. With newborns, I focus all on their perfectly natural beauty, and do not use props other than blankets and occasionally other decorative items you already have in your home. Trust me, your baby doesn’t need help looking perfect. They are perfect just the way they are and your photos will reflect exactly that. A pre-session consultation. This is how I get to know who your family is before we meet so we can plan the right kind of interactions during your session. A 75-90 minute photo shoot at your home in the Dallas/Fort Worth area. 50+ beautiful 16" x 24” sized digital images (in color and some may be black/white) that are as unique as your family is. Delivered via an online gallery approximately 3 weeks after your photo shoot, and ready for download. The option to order prints through our lab so you can proudly display your images printed professionally on high quality paper or canvas. Your baby will grow so fast and you'll find yourself wanting to freeze time as they reach new milestones and show all the fun new tricks they've learned. Each month on the second Friday and Saturday of the month, I host Milestone and Cake Smash Mini Sessions at my studio. These are perfect for capturing babies between 3 months – 12 months old. Whether they’re just learning to sit up or crawl around 6-7 months old and you just want to capture those rolly polly legs and dimpled cheeks and gummy grin, or you want to capture them smashing a cake in celebration of their first birthday – bring them in for a quick, easy shoot in my light, airy studio. A 20 minute photo shoot at my studio in Aledo. Includes one outfit and one child only. 15+ beautiful 16” x 24” sized digital images that are as unique as your baby is. Delivered via an online gallery approximately 3 weeks after your photo shoot, and ready for download. If you can't decide between a milestone and a cake smash session - ask us about upgrading to a Milestone Plus session. This gives you the best of both worlds! Want to capture a special milestone AND a few pictures of your family, while you’re at it? No worries. We can do both. A 35 minute photo shoot at my studio in Aledo, capturing your kiddo’s milestone as well as a few family photos. 30+ beautiful 16” x 24” digital images that are as unique as your family is. Delivered via an online gallery approximately 3 weeks after your photo shoot, and ready for download. A 20 minute photo shoot at my studio in Aledo. 15+ beautiful 16” x 24” sized digital images that are as unique as your family is. Delivered via an online gallery approximately 3 weeks after your photo shoot, and ready for download. Life at home can feel messy, hurried and at times chaotic and yet you realize at the end of the day, you wouldn’t have it any other way. Because in between the errands, the homework, the tears over broken toys and hurt feelings - there are priceless moments of pure joy, fits of laughter, complete relaxation, pure and simple love. You are at home with the people who matter the very most to you and these are the times to treasure. Home is the ideal place to capture your family as it is right now. Home is comfortable. It’s familiar. It’s where you let your guard completely down, laugh the loudest, hug the tightest, and escape the rest of the world for a while. During these sessions, you simply play, laugh, and love together – just like you always do - and I capture those beautiful moments for you to keep in photo form forever. What It’s Like: Relaxed and Natural - During these sessions, I direct you into natural interactions with your family and capture the perfect, un-posed moments that look naturally beautiful, flattering, and real. Genuine and Playful - The way you connect with your family is what makes your relationships unique and it looks amazing through my camera lens. 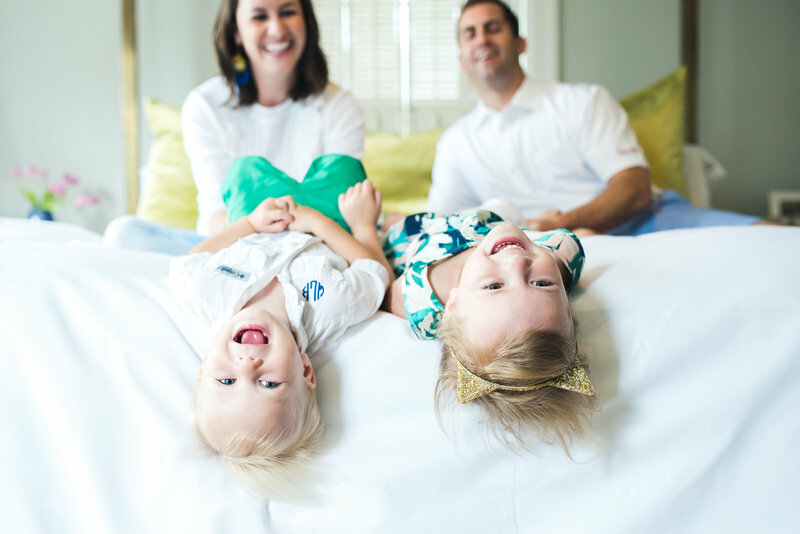 Through games, story telling, and being a little silly, I will help facilitate both sweet, loving moments and playful interactions between you all to create a gallery of images that perfectly captures who your family is today. A 60 minute photo session at your home. 40+ beautiful 16” x 24” digital images that are as unique as your family is. Delivered via an online gallery approximately 3 weeks after your photo shoot, and ready for download. Memories are made all over the place. While I do love shooting in my client's homes, I've captured families all over the metroplex and no matter where we are, we find a way to make it a fun, memorable outing. Whether it's relaxing on the lawn of a local museum, jumping into the pool together at a country club, or simply taking a stroll through your neighborhood, we will capture fresh, fun, modern portraits of your family being exactly who they are. What It’s Like: During these sessions, we will explore a fun spot outdoors and like all my family session, I will direct you into natural interactions with your family and capture the perfect, un-posed moments that look naturally beautiful, flattering, and real. 40+ beautiful 16” x 24” sized digital images with a 60 minute session (or 60+ images with a 90 minute session) that are as unique as your family is. Delivered via an online gallery approximately 3 weeks after your photo shoot, and ready for download. 60 minute sessions are $675. 100 minute sessions are $900. Seasonal (spring/fall) Family Mini Sessions are only available to existing clients that have done a full session with us in the past 18 months. These 20 minute sessions sessions are scheduled ONLY on specific dates that I choose in the spring and fall and have very limited availability. Sessions include 7 digital images, sized 16"x24". What It's Like: Welcoming a new baby in to your family is such a big part of your story. We capture plenty of images of baby alone – all the little perfect details of them - as well as photos of you cuddling, soothing, and simply adoring your new baby. The studio is set up to be relaxing environment for families to come and capture lifestyle photos of their family. Siblings are encouraged to be a part of the shoot as well. However, due to limited studio space, these sessions are limited to a maximum of six (immediate) family members. We take things easy, work with your baby’s needs, take breaks for feeding, changing, and soothing – and end up with a gorgeous gallery of images captured in my natural light studio. During our time together, I’ll guide you in to poses that feel natural so images will look organic and real - not stiff or overly posed. With newborns, I focus all on their perfectly natural beauty, and do not use props other than blankets and occasionally other decorative items that you bring from home. Trust me, your baby doesn’t need help looking perfect. They are perfect just the way they are and your photos will reflect exactly that. Pre-session information to help you prepare for your session. A 75-90 minute photo shoot at my studio in Aledo, capturing your new baby and what your family now looks like. PHOTOS by REVERIE PHOTO CO.